We spent a lovely three days in Gaspé enjoying the town and waiting out some unfavourable (25 to 35 knot) winds. 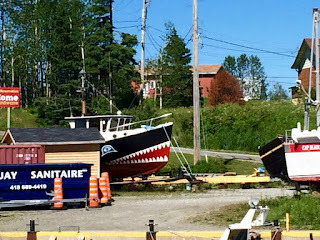 We took multiple walks in town, along the waterside board walk, up to the Musee du Gaspé and further up to the ice cream store with its magnificent views of Baie Gaspé. On the dock one day, a woman named Tracy stopped me as I had a Mimico Cruising Club sweater on. It turns out she and her husband Donald had purchased a sailboat named Jazz V, owned by our good friends Warren and Shirl. That coincidence is on top of the fact that the owners of Encore used to own a sailboat named Duck Soup they bought from another Mimico member named Sid. What a small and wonderful world this is. 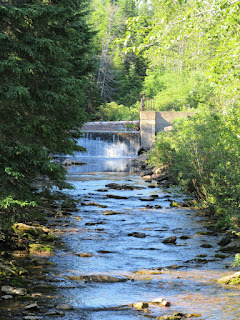 Saturday, July 16th rolled around and with its light wind forecast and clear sky we continued with our adventure. 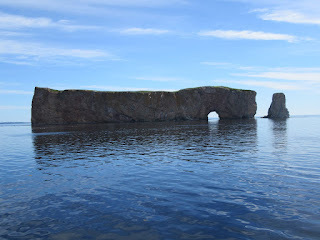 Today we’d pass Percé Rock, Ile Bonaventure and end up in L’Anse-a-Beaufils for the night. Because we’d seen so many whales and porpoises on our way in Baie Gaspe, we were anticipating another round of whale sightings. It turns out we didn’t see one whale or porpoise. Who knew it could differ so much from one day to the next. As we exited the bay, the famed Percé Rock and Bonaventure Island came into focus. 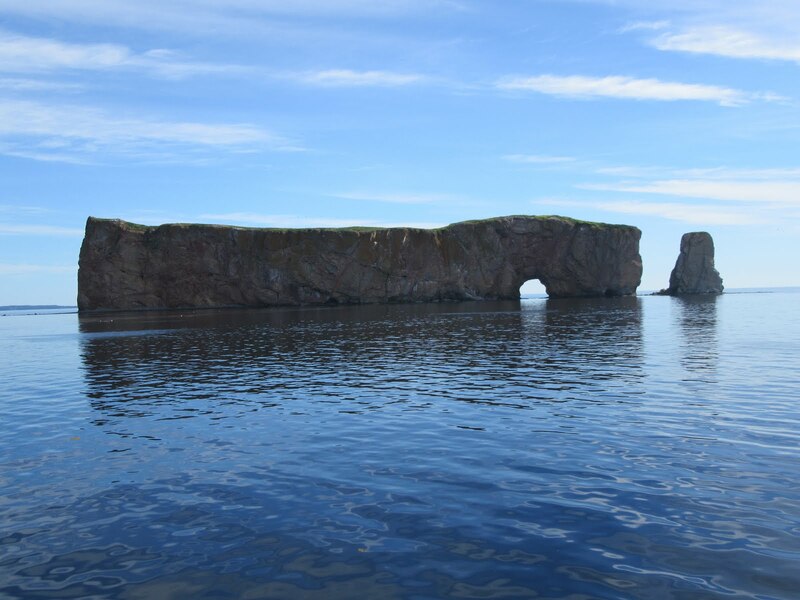 Percé Rock is an immense limestone rock dated more than 400 million years old. 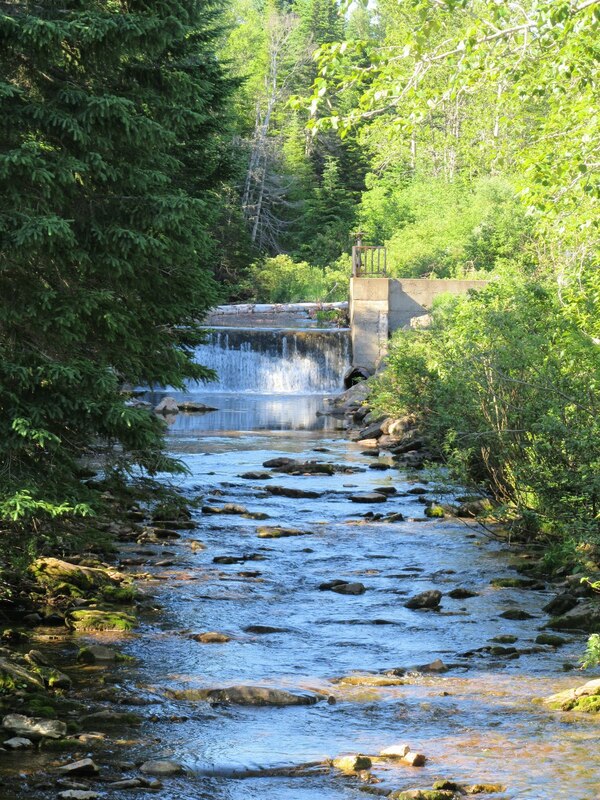 Fossils in this area show a variety of animal and plant communities from both terrestrial and marine habitats from the Devonian period. Originally Percé Rock was attached to the main land. When Jacques Cartier first arrived here in 1534 he reported three openings / arches in the rock. In time, two of the arches disappeared with the last one collapsing on June 17, 1845 leaving a separated pillar. The openings were cut through by sea waves. The current arch is about 49 feet high and a small boat can pass through the arch during high tide. Percé Rock of course is a major tourist attraction in Quebec with magnificent views from both the small village of Percé and nearby Bonaventure Island. We took our time getting close to Percé Rock and taking far to many pictures and marvelling at the immensity of it. The rock is estimated to weigh 500 million tons and about 400 tons of rock erode each year, such that it will disappear within 16,000 years. Next, we headed a little more south east and circumnavigated Ile Bonaventure. 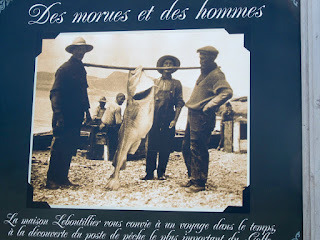 This island was an early seasonal fishing port in New France. 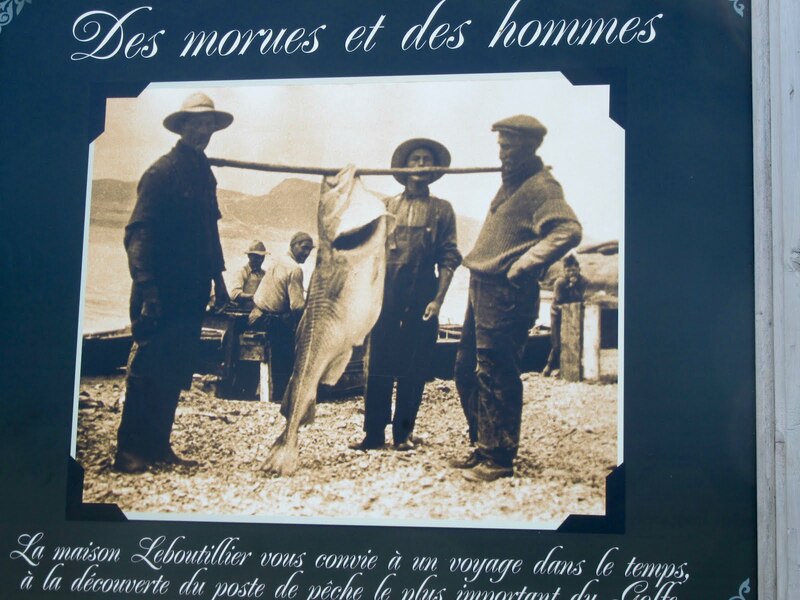 Settlers from southern Ireland came here in the early 1790’s and later, Peter Du Val, from New Jersey set up a fishery which lasted 25 years, closing in 1845. 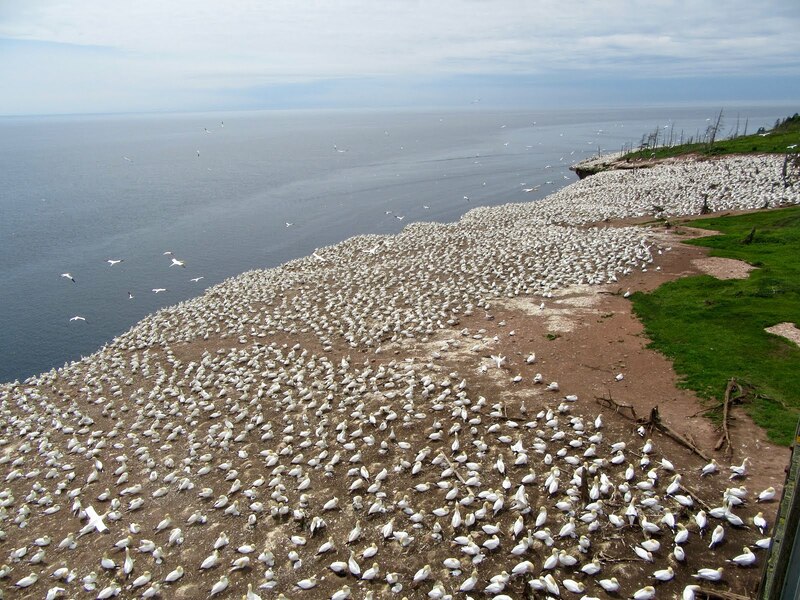 In 1919, Ile Bonaventure became a bird sanctuary as a result of the Migratory Bird Convention reached between Canada and the United States in 1916. The Province of Quebec expropriated the island in 1971 and later, grouped it with Perce Rock to form Parc National de L’ile-Bonaventure-et-du-Rocher-Percé. 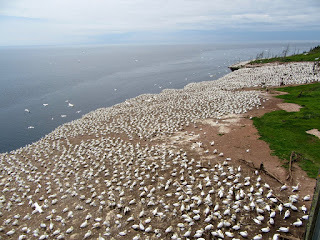 Ile Bonaventure is now one of the largest and most accessible bird sanctuaries in the world with more than 289,000 birds. It is a major tourist attractions with boat and island tours from May to October. 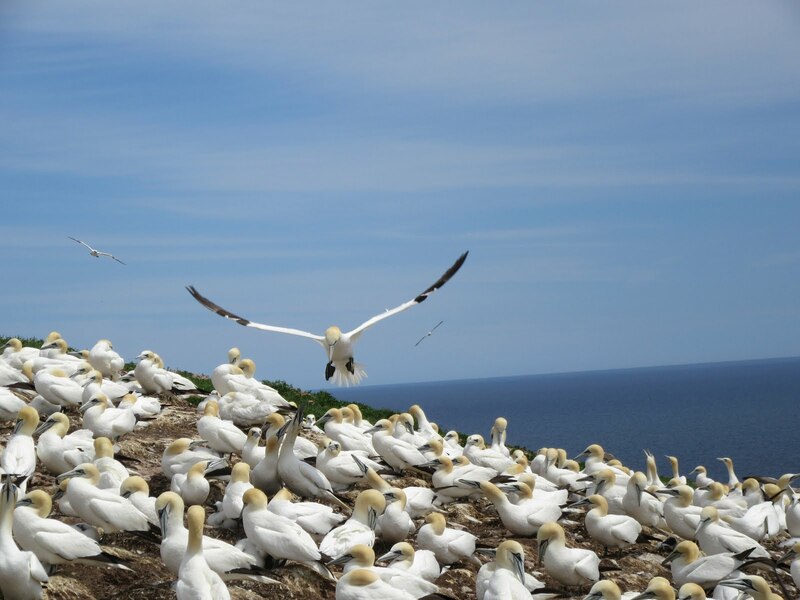 There are 293 different species of birds recorded as visiting, migrating to, or living on Ile Bonaventure. 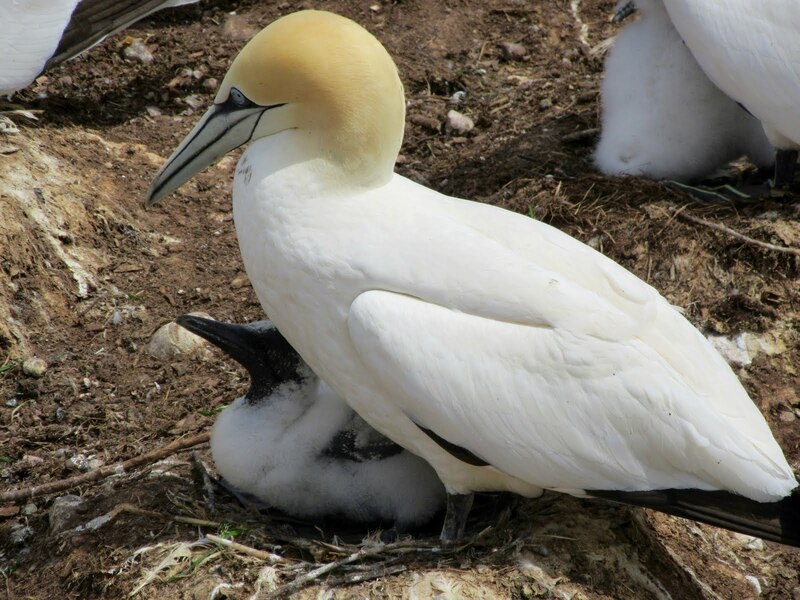 The most common bird is the northern gannet with about 52,000 nesting pairs. 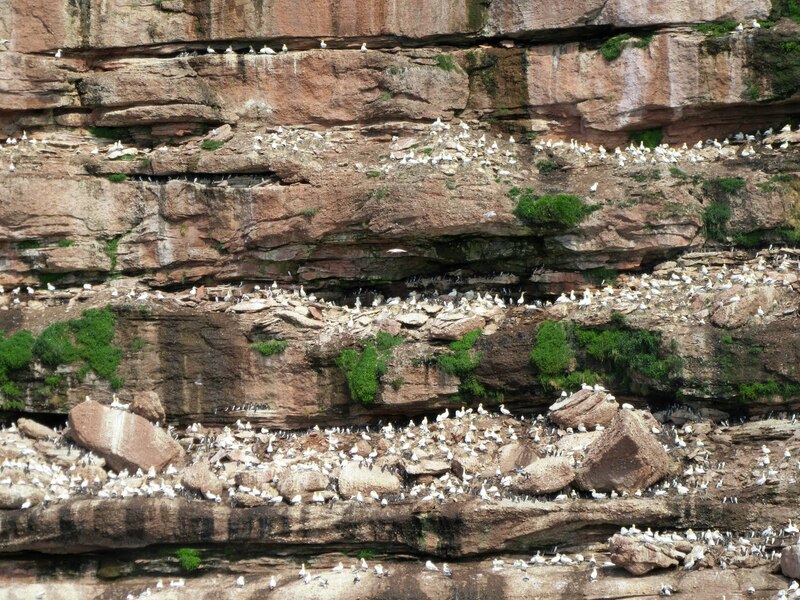 Other species include the black-legged kittiwake, the common murre, terns, black guillemots, auks, herring gulls, Atlantic puffins and many more. It was hard to properly capture the vast numbers of birds we saw, but it was an amazing sight to see. An hour later we pulled into the charming harbour in the tiny village of L’Anse-A-Beaufils. 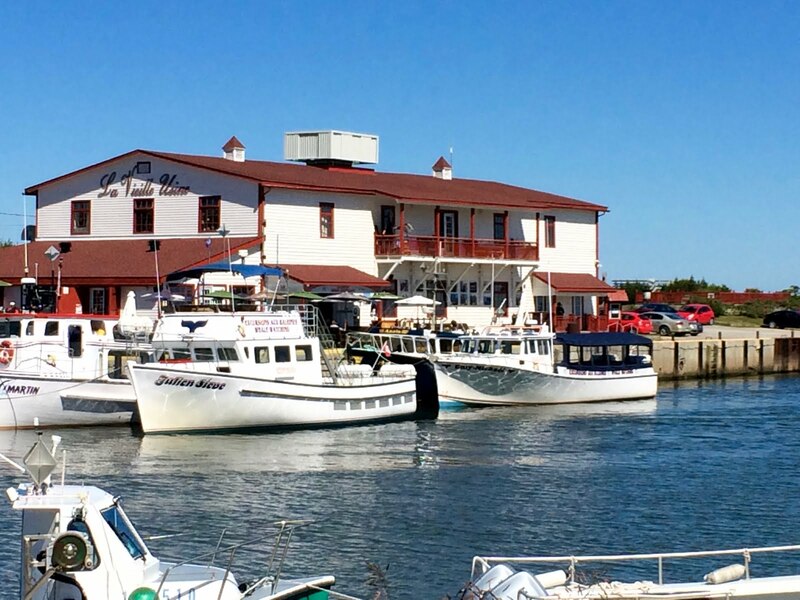 This is a former cod fishing port that has gone through a metamorphosis to its current state. When the cod fishery died, 49 residents of the village bought the fish plant and converted it to an art gallery, theatre and restaurant. 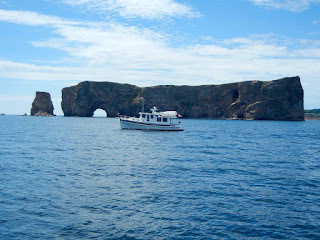 Tour boats also take tourists out to see Percé Rock and Ile Bonaventure. A micro brewery now occupies another piece by the harbour that previously housed more of the fishery operations. You’ve never met a more friendly and pleasant group of people who are clearly very motivated to make their businesses a success. 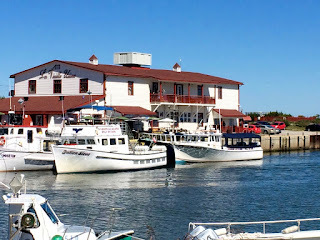 Fran and I couldn’t resist sitting down at the restaurant for a bowl of their scrumptious Fisherman’s Soup with fresh cod and salmon. 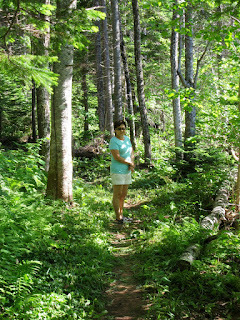 Later, we did a hike along the “river trail” by the Riviera du Portage through a beautiful forest. At our happy hour on the dock, we met up with Roger and Chris off a 52’ Bayliner named Miss Utah (named after their former dog whose ashes travel on board with them in a small box). 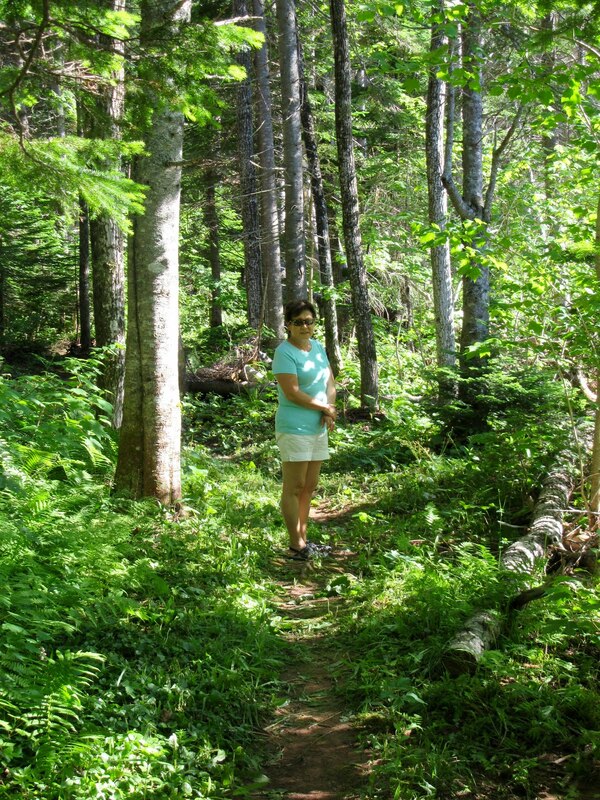 They had spent the day on Iles Bonaventure hiking the trails to see the bird sanctuary and their enthusiasm convinced us to stay another day. We were up at 0600 and over to the commercial dock by 0715 to hitch a ride with the tour boat operators over to the village of Percé from where we’d buy a ticket for the tour of Iles Bonaventure. It was a bright sunny day with a light breeze and a very comfortable temperature. Bob and Jan off Wings came along and spent the day in Percé as Bob’s hip and use of crutches wouldn’t let him do the hike. Lee and Barbara from Encore joined us on the hike. 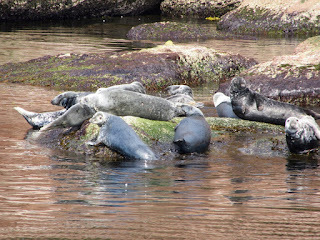 The tour boat first took us around Iles Bonaventure where we got a good view of the grey seals that enjoy the rocky shoreline. Then we were dropped off at a dock at the island and after a brief explanation of the trails, we set out across the island. 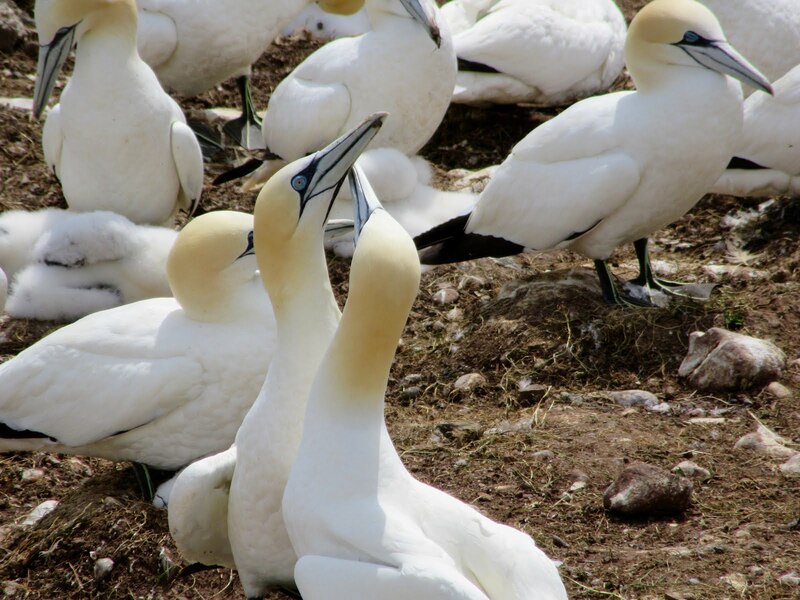 We walked through a beautiful forest on a well built trail & boardwalk and as we approached the east shore, you could hear the calls of the northern gannets from quite a distance. 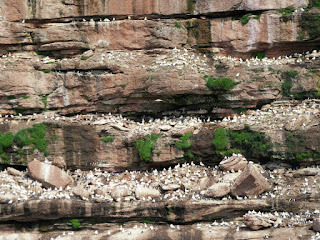 The size of the breeding ground and numbers of birds was overwhelming. Northern Gannets are seabirds. They nest on offshore islands and inaccessible cliffs and eat fish and squid. They plunge dive from a height of up to 130 feet, vertically into the ocean at speeds up to 62 miles per hour. Most dives are shallow, but they can go as deep as 72 feet below the surface. Northern Gannets breed in only six well established colonies in the Gulf of St. Lawrence, Newfoundland and North Atlantic. 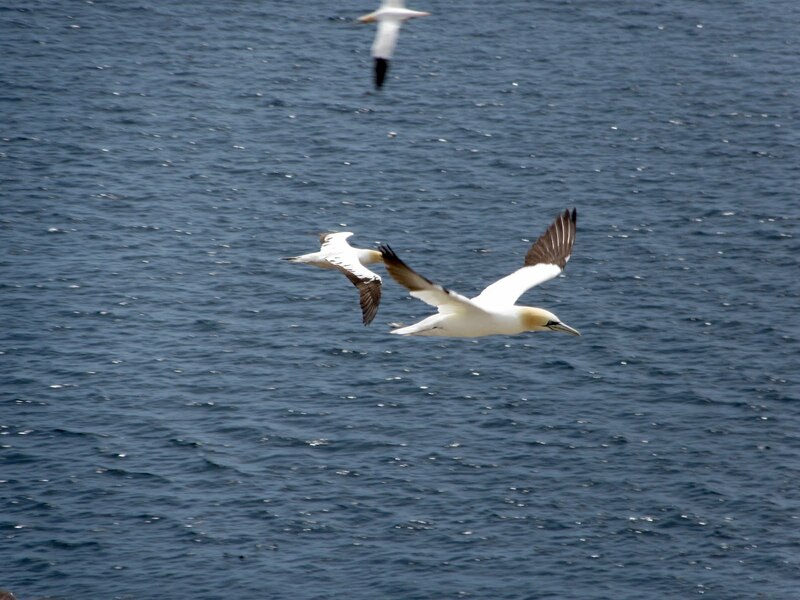 The oldest recorded Northern Gannet was over 26 years old. Their nests are made from a compacted pile of mud, seaweed, grass, flotsam and feathers cemented together with excreta. Each nest and its perimeter is about 18” square. Another bird dare not enter that space or they will be subject to a severe attack by the occupying bird. 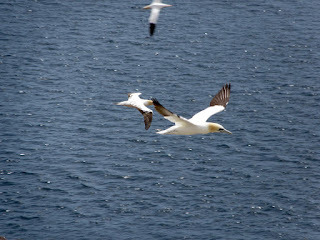 Our 10.8 kilometre hike around the island gave us views of three enormous colonies of Northern Gannets. In those areas where the wind was offshore, there was next to no smell. In other areas the smell was a little more ripe. You really have to see the numbers of birds to believe it. 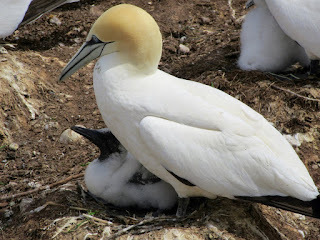 In some locations we were a mere three feet away from the nesting birds; it was quite an experience. At the end of our hike, we toured one of the well preserved former residences of the island. It contained a short exposé with graphic memories of young boys who worked in the harsh conditions in the local fish processing plant. It is fair to say no parent or child would ever want to work in such conditions today. We returned to Percé for a late lunch with Bob and Jan and then hitched a ride back to L’Anse-a-Beaufils as the clouds rolled in, the temperature dropped and the rain began. We enjoyed a hot shower on the boat and a quiet evening on board with the heater going.